SINGAPORE, SINGAPORE--(Marketwired - Sept. 1, 2016) - Terra Nova Energy Ltd. ("Terra Nova" or the "Company") (TSX VENTURE:TGC)(OTCQX:TNVMF) is pleased to announce that it has entered into a Farmout Agreement ("Agreement") with Zeta Petroleum (Romania) S.R.L. 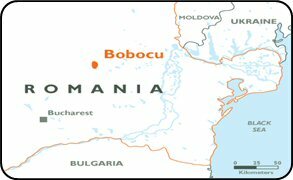 ("Zeta Petroleum") to acquire up to an eighty percent (80%) participating interest in the Bobocu License, onshore Romania. Terra Nova will be entitled to acquire an initial forty percent (40%) participating interest in the Bobocu Production License upon: (1) The drilling of one commitment side-track entering of an existing well ("well") on the License; and (2) Cash payments totaling USD $1,040,000, of which 40% of the cash payment will be paid on certain milestone events and 60% of the cash payments will be paid out of Terra Nova's entitlement to future production. Terra Nova may acquire an additional forty percent (40%) participating interest in the Bobocu Production License by drilling one additional exploration well to a total depth of 2,800 meters and making an additional cash payment totaling USD $1,040,000, of which 50% of the cash payment will be paid on certain milestone events and 50% of the cash payment will be paid out of Terra Nova's entitlement to future production. The obligations under the Agreement are conditional on, among other things, National Agency for Mineral Resources' unconditional written approval of the assignment of the participating interest to Terra Nova and the side-track well. To view the map associated with this press release, please visit the following link: http://media3.marketwire.com/docs/Romania.jpg. Henry Aldorf, CEO of Terra Nova stated: "We are looking forward to working with our partner Zeta Petroleum to develop the Bobocu license in Romania, a member country of the European Union and the OECD. Romania, contains South Eastern Europe's most significant oil and gas reserves and possesses surplus refining capacity. The extensive existing infrastructure, the attractive prospective geology and its strategic location within the European energy markets all creates a robust environment for the Romanian petroleum industry. Romania is currently the largest natural gas producer in Eastern Europe." The Bobocu gas field is located in the foreland basin of the Carpathians 150 km NE of Bucharest, Romania. The field was discovered by Romgaz in 1966, and produced from 1977 to June 1995, and again from December 2000 until November 2001. A total of 31 wells have been drilled in the area and gas has been produced from 14 Upper Miocene sandstone reservoirs located from 2,500 meters to 2,700 meters in depth. Total production to date has been 33 Bcf (10.4 Bcm) from 15 wells. The field was discovered and developed solely on 2D seismic data. Terra Nova's partner has acquired 75 km2 of 3D over the field, which has been reprocessed. Robust Project Economics: Gas prices for gas produced in Romania are regulated by the Regulatory Authority for Energy (ANRE). The current average monthly regulated price for domestically produced gas is RON 60 per MWh or approximately US$ 4.00 to US$ 4.50 per mmcf. Proximity to Key Infrastructure: The Bobocu Gas Field has a 10 inch pipeline connecting to the high-pressure national grid. Near term monetization of potential gas reserves as early as 2017. About Terra Nova Energy Ltd.
Terra Nova Energy Ltd. is an oil and gas company with a 20.66% working interest in two onshore petroleum exploration licenses ("PELs"), being PEL 112 and PEL 444, located on the western flank of the Cooper Eromanga Basin in the State of South Australia, Australia. Its common shares trade on the TSX Venture Exchange under the symbol "TGC" and its ordinary shares trade in the U.S. on the OTCQX marketplace under the symbol "TNVMF."